Sometimes all you need is a simple surprise to make your day. Yesterday afternoon was a scorcher. Ninety-degree weather with a heat index well into the 100s. My sister and I planned to get the kiddos together, thinking a late afternoon walk through Maymont Park might be a nice, refreshing change from the day-to-day mom mode of summer. We walked and we walked and we walked. There wasn’t much of a breeze, so our sweat clung to our clothes as if we had been caught in a downpour of rain. 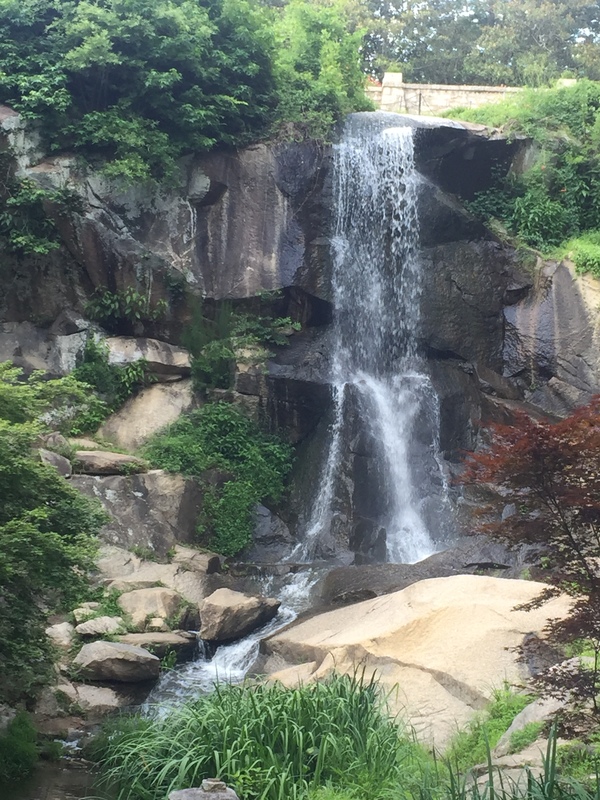 Some may have questioned why on earth we were still out in all this heat, but we knew what we wanted to see: the beautiful waterfall in the Japanese Gardens. 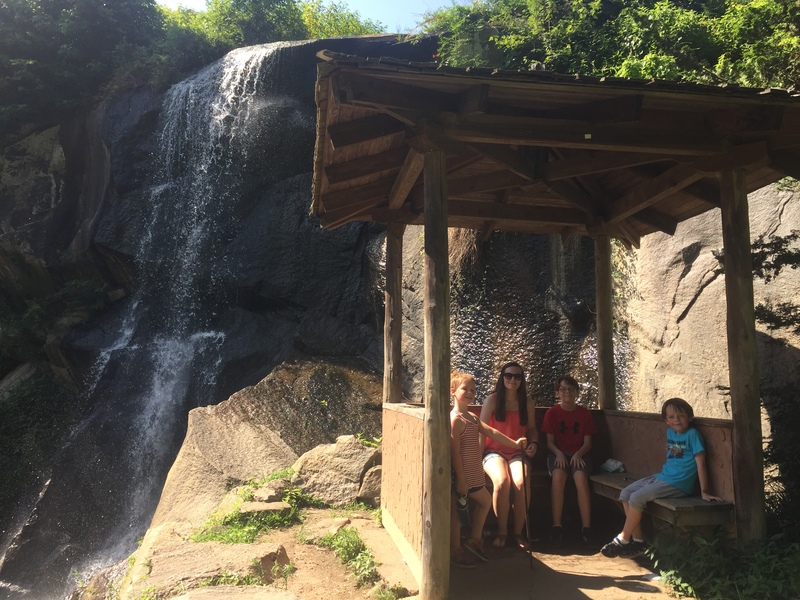 Our children climbed the rocks to sit in the tiny pagoda, a family tradition from when my sister and I were young and would come here with our dad. We reveled in the moment, knowing we were passing down our own childhood memories to the next generation. Two hours later, we ended our walk where we began, gave our hugs goodbye, then headed home. As I pulled into my driveway, I saw an Amazon box by my front door and was surprised to see my name on the front. I thought perhaps I had received an item in error, or maybe my daughter had ordered something delivered in my name. I carried the box into the house and sat on the floor to see what was inside. Using scissors, I carefully cut the packing tape across and lifted the edges to discover a speck of red peeking out. 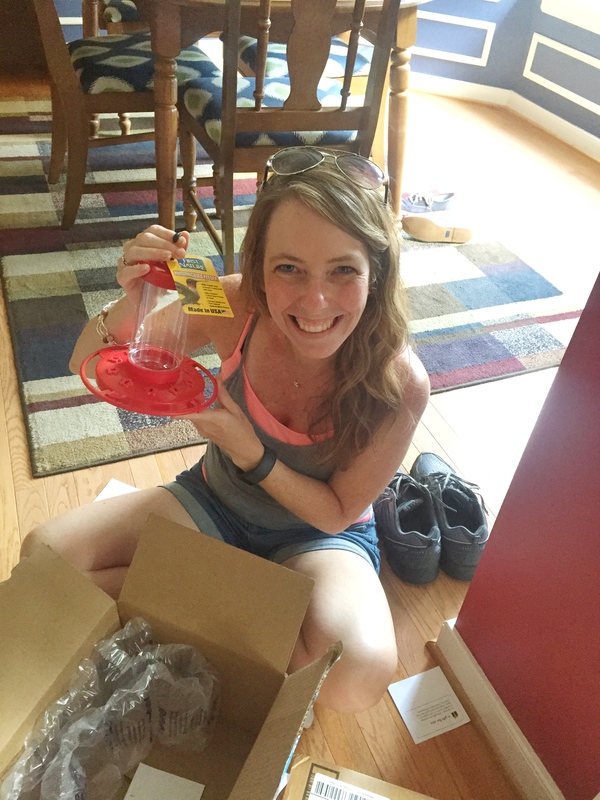 That’s when I started to laugh with childlike wonder… it was a hummingbird feeder! 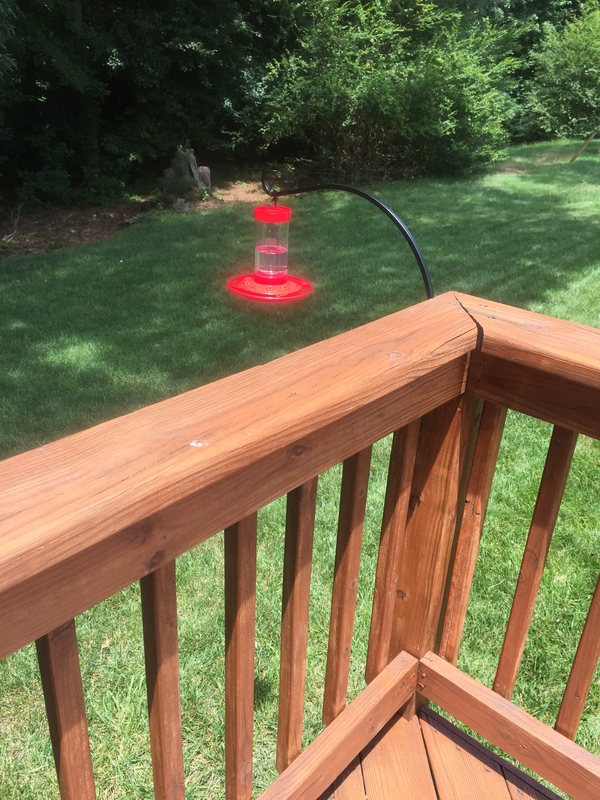 Attached to the feeder was a small note from my friend, Karen Richardson, who blessed me with this surprise in response to my comment about her blog post this past week. Both she and Donna Donner described the joy of watching hummingbirds from their yard and I stated that I needed a hummingbird feeder, too. And with that one statement, a random act of kindness was delivered. What Karen and Donna don’t know is that we did a “deck overhaul” just a few weeks ago. We took down the table, chairs, and umbrella, stained each and every wooden plank, then purchased two lounging chairs, three folding chairs and a small side table to make the deck more like a relaxing “outside office” for me to do my writing this summer. And now… I can watch the hummingbirds linger as I write, read, and play. Thank you, Karen, for your gift of friendship and kindness and for reminding me how wonderful it is to be on the receiving end of a simple surprise. You absolutely made my day! 2 Responses to "Simple Surprises"
Thank you for spreading joy and love to everyone you touch! I wanted to give you a little sense of that joy for yourself. You are wonderful! I was, and continue to be, filled with glee! So sweet of you to think of me and fill my world with joy!